Now that Spring will soon be on it’s way it’s time to brighten up the house decor a bit for the sunnier months. I love updating my home according to the seasons and bringing some colour in. It makes me feel sunnier and happier somehow! One of the places I’d like to bring some more colour into is my kitchen. We have quite a bland backdrop with white cupboards and grey counters and floors so it’s really easy to update with colourful accessories. Here are my top tips for bringing more colour into your kitchen. Dress up your windows with colourful blinds or curtains. These will really reflect the colourful light into the room too when the sun is shining. 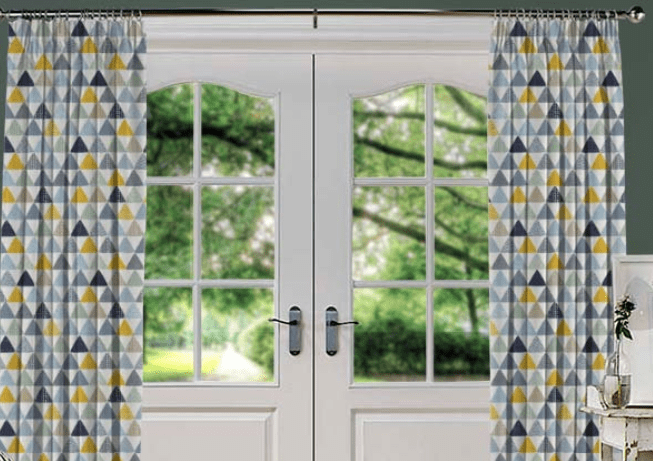 I really like these ones from Direct Blinds as they have a modern pattern and are nice and colourful too. It’s really easy to bring a spot of colour into your kitchen with appliances that are colourful. You can get matching toasters, kettles, microwaves etc. now all in different colours. You could even get your fridge to match too! Brighten up the space with flowers. You can use fresh flowers or you can get some really great quality fake ones too in shops like Homesense or Ikea. I really like a bunch of daffodils in the kitchen in spring time, they are so fresh and bright. You could brighten up the space with brightly coloured dining chairs. Take a look at Pinterest for some inspiration. If you have the space and you have a big kitchen diner you could go for a colourful feature sofa too. Another easy way to update a room is to accessorise with a rug. A bright coloured rug or doormat could add a real pop of colour in a kitchen. Make sure you get one that is easily wipeable or washable for the kitchen space though. You can get plenty of bright tablewear that will add some colour to your kitchen. Build a collection of bright plates and serving dishes and they will add pops of colour whenever you use them. Brighten up the space with some colourful artwork on the walls. It doesn’t have to be anything expensive, you could just hang a couple of unframed prints or pop a cheap canvas up. Will you be making your kitchen more colourful this spring? I think these are awesome ways to add color to your kitchen. I think art is one of my most favorite ways to decorate a room. It would be nice to add more color when you can, especially during Spring! Those curtains are gorgeous and I’ve been lusting over the SMEG appliances for as long as I can remember. I love the red ones, one day I will have a SMEG red fridge. I am in the process of redecorating the whole house, whilst my kitchen is white I love injecting flowers into it to really bring it to life. Great ideas. Color can make such a difference in any room. I love the daffodils, they are one of my favorite flowers. I’m starting a garden this year – maybe I’ll plant some daffodils! They are a great flower to use to add color to your kitchen because once you plant them they come back year after year. I absolutely love your ideas to bring more color to the kitchen! I’ve been wanting to do this for awhile so I really appreciate your tips! Love the idea of using art work to brighten a home, I so need to do this and have the stuff from Ikea but too scared to drill in our rented house boooo.